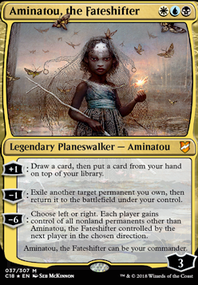 Not much surveil for a Dimir deck, given it's their signature. If you want to go more with the surveil theme I'd highly recommend Dimir Spybug, Thoughtbound Phantasm, and Nightveil Sprite. 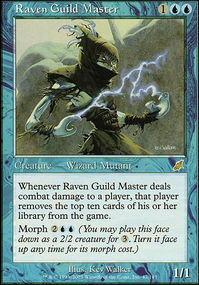 If you're open to Dimir cards from past Ravnica sets, there's a bunch of cool ones all with the transmute ability (Dimir's old signature ability) like Perplex and Dimir Infiltrator (not the best examples maybe), and others like Notion Thief, Psychic Drain. I could go on and on, Dimir was always my favorite. Hey man, nice deck. Perhaps Mindcrank can help you out with that Duskmantle Guildmage for a combo. Tome Scour and Thought Scour to speed things up. Kudos for using Psychic Drain I never seen that, cool card. SynergyBuild on What is yours is mine! To start, I'll work on the manabase. Temple of the False God and Darksteel Ingot should be dropped immediately, with Talisman of Indulgence and Mind Stone as nearly direct upgrades in this specific deck. 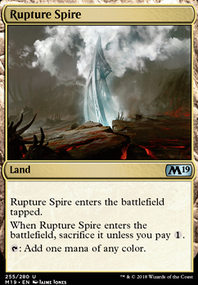 I would also drop Rogue's Passage, Dismal Backwater, a single Swamp, and Dimir Aqueduct for Darkwater Catacombs, River of Tears, Fetid Pools, and Underground River. This should smothen your draws and manabase, giving you your colors faster and more efficiently, for a small cost. 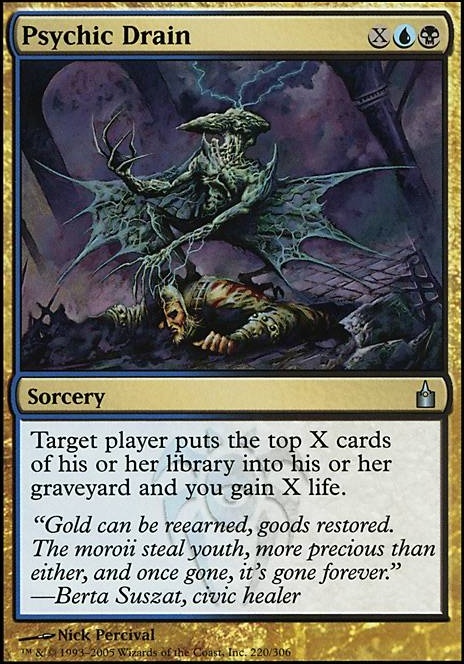 Other cards I would drop outside the manabase would be Grisly Spectacle, Balustrade Spy, In Bolas's Clutches, Hedonist's Trove, Psychic Strike, Fated Return, Keening Stone, Mindcrank, Trepanation Blade, Riddlekeeper, Dreadwaters, Increasing Confusion, Paranoid Delusions, Psychic Drain, and Traumatize, many of these 15 cards are simply overcosted or only affect one player, and don't do enough. You do have Drift of Phantasms but more tutors are always good - like Dark Petition or Diabolic Tutor. I don't recommend adding tons of them, but those are some options. Also, you don't have very much removal in the deck so far, I don't think, and you don't have much recursion. I'd also recommend more land than 29. Mortuary Mire is a good start for two of those. Hey bigblue32123, I appreciate your suggestions and have been thinking through them for the past month. I agree with you about those one-off spells that mill X - not the best use of my mana, especially in commander when there are so many cards to mill. Those single-use spells don't have a lot of long term value. So I took out Increasing Confusion and Psychic Drain and replaced them with walls (Wall of Frost and Hover Barrier) that can offer some blocking protection and tap with Phenax to mill a decent amount. I'm still not sold on Intruder Alarm for this particular Phenax build. The potential to prevent my own creatures from untapping (meaning they can't re-tap to mill more with Phenax in play) is just too great and I don't have that many creatures to really abuse Intruder Alarm. I'm also not sure Intruder Alarm combos with Rise of the Dark Realms: I believe all creatures enter the battlefield at once, causing only a single untap trigger on Intruder Alarm (not one untap trigger per creature). lol BanditRaccoon123. 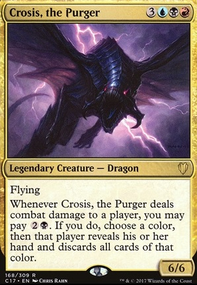 Not sure if you're talking the CMC (not the best, but not the worst), the price tag of the cards (the most expensive cards I already had, or bought before they were so expensive) or the cost of losing your playgroup when you mill them to death. That last one's the toughest. Hi! Gave me some ideas to improve on my good old Ravnica Dimir deck :) You might want to put Shriekgeist into your creatures. Cheap nice fellow who helps with milling. Or for the multiplayer, Wight of Precinct Six might come in handy (and heavy), so would ths guy: Jace's Phantasm. For some cheap milling, here goes Thought Scour. And of course, Dampen Thought. If you have some mana to spare, Psychic Drain is a nice one too. If you want to invest some money into your deck, the ultimate milling thing is Glimpse the Unthinkable which would get deadly with your enchantemnts.